Home | Furniture | Built-ins | Custom Creations | Contact .. 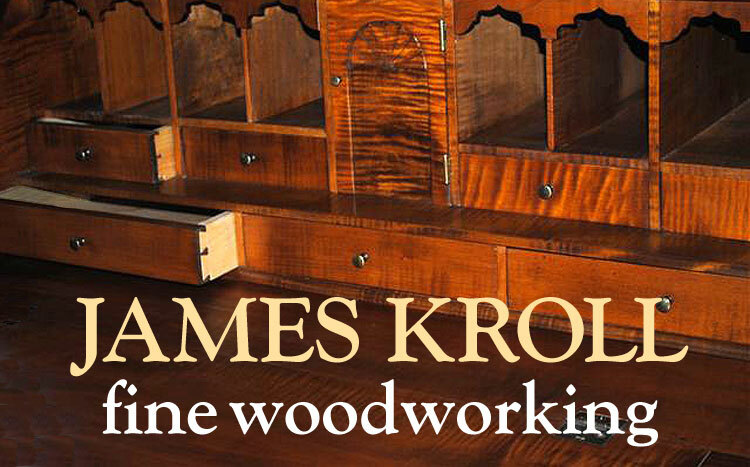 Since 1987 James Kroll Fine Woodworking has been creating custom and reproduction pieces for people looking for something well made, unique and specific that will fit in with the decor of their home. Most of the time, I have worked with the customer, their space, taste and budget to make a personalized piece of furniture or built-in to their standard, satisfaction and often, to their surprise and delight. If you've been looking for a period piece or something ready made in a showroom but nothing is quite right, I can be of service. I work with customers all the time to come up with the right design, wood, hardware and detail to create what you have been looking for and were always hoping to find. I would be happy to discuss your thoughts with you and pleased to give a free, no obligation quote for your project. All inquiries are welcome with a promise of a prompt response. "It's amazing how you can take an idea and materialize it as perfectly as you do. I cannot say enough how talented you are - the kitchen table and the bench are both exactly as I envisioned them. Absolutely perfect! Both your talent as a craftsman and your attention to period detail amaze me." "We love the maple and cherry table and the matching china cabinet. Your craftsmanship is wonderful with the handmade knobs and special features, which have made these pieces the topic of many dinner party conversations. We're looking forward to having more furniture made. Thank you, we appreciate your hard work."